Oh hey. It's been a few, huh? I'm sorry about that. It's me, not you! After Greece, B and I dove headfirst into one of the busiest months in our work year. Between long hours and searching for an apartment in our free time, something had to give and this was sadly it. Truth be told, I was also burning the candle at both ends (#OverAchieverProblems). I really needed a social media break to decide if this is something I really still wanted to do. I really missed this blog I call home (and Instagram, too!). So while I'm scaling the posts back a bit, down to two a week, I really missed taking part in the conversation about two of my favorite hobbies. 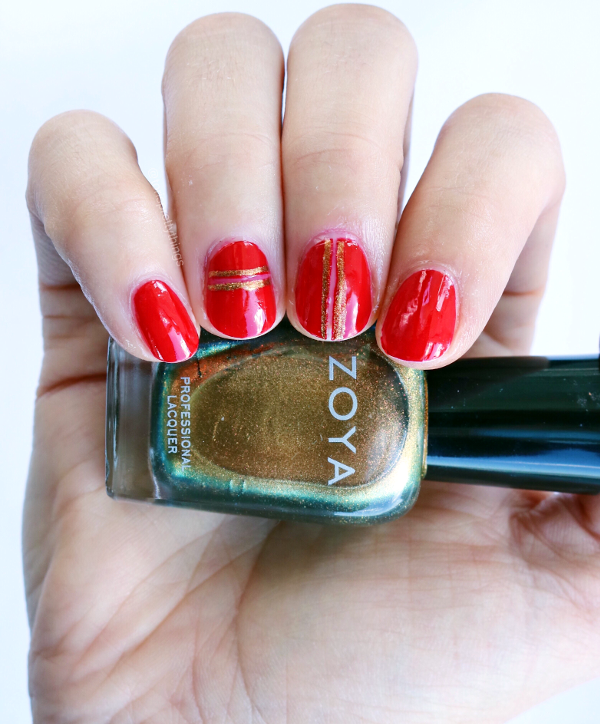 Notice anything different in this week's mani? I changed my nail shape! For as long as I can remember, I've been living the squoval life (It's a real word, Google it.) Lately, though, I'm seeing oval nails everywhere...and now I can't stop noticing them! From watching Giada cook on my TV to my lovely friend Shannon who I just did a mani swap with, the feminine and classic nail shape kept drawing me in. So I gave it a go! I'll check back in down the road to let you know how they continue to do over time. Right this very moment though, I recommend the shape switch! As soon as I filed them, only one color came to mind: Red. 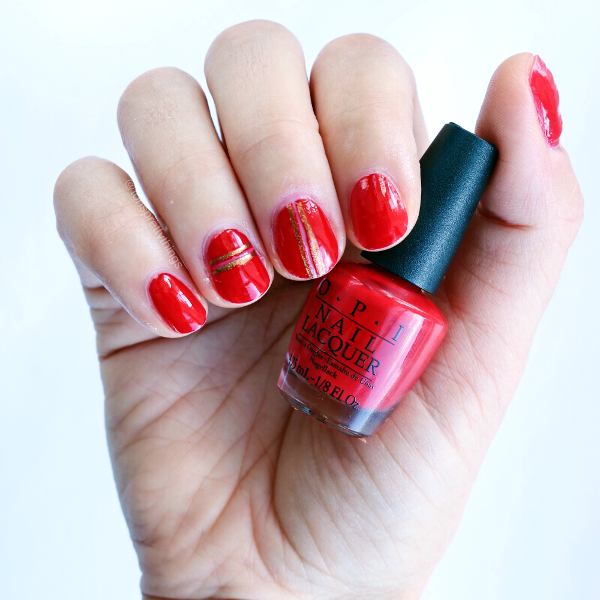 A classic, feminine, beautiful red. 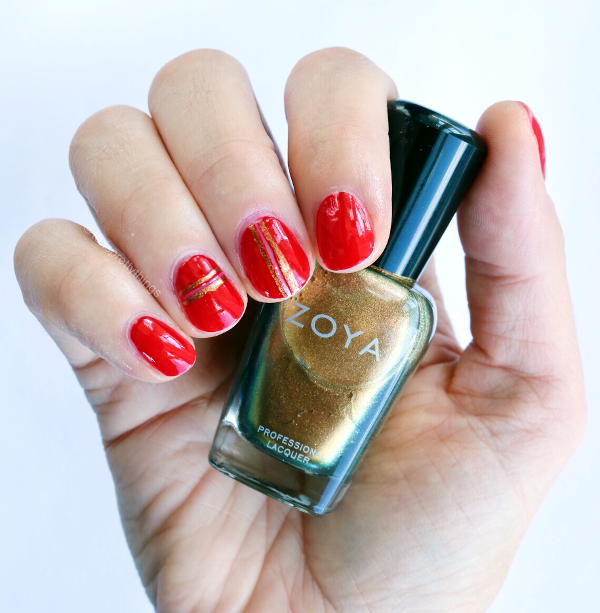 To accentuate this new shape, I paired OPI's Big Apple Red with a minimal, negative space design outlined in gold with Zoya's Aggie. To achieve this look, I painted two coats of red on my pointer, pinkie. and thumb. For my middle and ring finger, I first put down a striping vinyl. Then I painted two coats of red, pulling the vinyl up immediately after the second coat. I then painted two gold lines to outline the negative space. Once dry, I finished the mani with a fast-drying top coat.